One of my favorite economic reports is produced by the Institute of Supply Management, a manufacturing trade organization. Its monthly survey of purchasing managers called the Purchasing Managers' Index (PMI) is useful because it summarizes current activity and expectations among purchasers for the future. The PMI report is important because it measures manufacturer sentiment rather than just quantitative throughput. If manufacturers are doing well right now but are expecting a downturn soon, it will show up in the PMI report. Because it asks questions about the future, it tends to lag a lot less than other measures of manufacturing data. 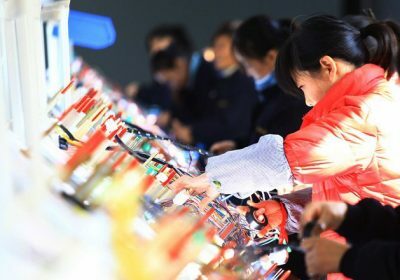 There are versions of the PMI report in most economies, including one produced by IHS Markit that covers Chinese manufacturers called the Caixin Manufacturing PMI. That report was released on Sunday and showed that manufacturers were much more positive than originally expected. This matched a similar PMI report for China released on Saturday by the China Federation of Logistics and Purchasing. Chinese manufacturing sentiment had drifted into negative territory last November, so the weekend PMI reports were seen as an important shift for equity and commodity prices. Oil rallied as expected, Chinese stock indexes spiked, and major U.S. stock indexes were also higher today. 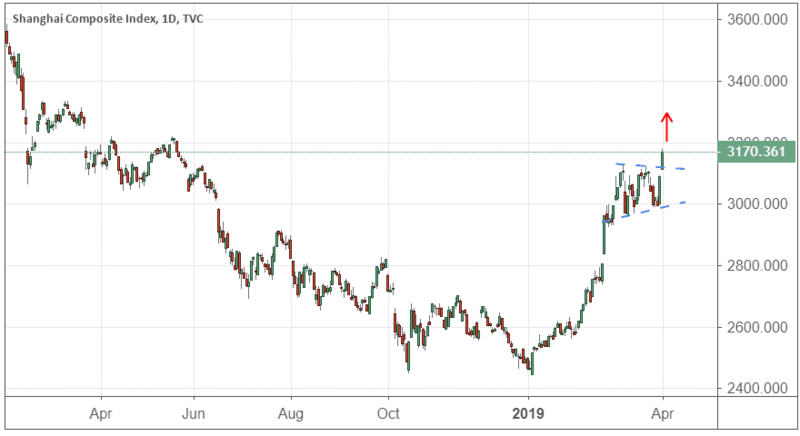 As you can see in the following chart, the Shanghai Composite index broke out of its pennant consolidation pattern and entered a bull market today. I mentioned this same index last week as a potential red flag if it broke support. At this point, investors are temporarily in the clear, as most emerging markets should follow the Chinese indexes. I also pointed out last week that the S&P 500 had paused at the neckline of its inverse head and shoulders pattern. If the index rallied from that point, it was more likely that the price would continue to rise in the short term. 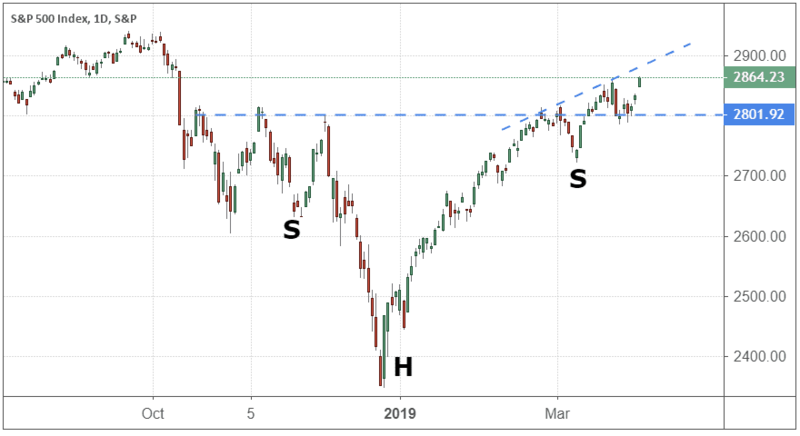 This analysis was based on historical studies of the success rate of inverse head and shoulders patterns that included a retest of the neckline versus those that did not retest their neckline breakout point. In my opinion, the technicals today look good – however, it still makes sense to remain somewhat cautious. Earnings season for the first quarter will kick off near the April 14, and investors will be looking for improvement in operating margins, which have been deteriorating for almost a year. Even if prices continue to rise, I believe that traders will be looking for profit-taking opportunities at the prior highs near 2,900 to 2,950 on the S&P 500. The reversal in Chinese stocks makes other risk indicators look a lot better today. In fact, one of my only concerns is that high-yield (HY) bonds aren't exhibiting a proportional move today with stocks. Unlike so-called "investment-grade" bonds, high-yield bonds act a lot more like small-cap stocks. However, frequently, HY investors will identify underlying market weakness and begin selling well before stock investors will. As you can see in the following chart of the iShares iBoxx $ High Yield Corporate Bond ETF (HYG), HY investors started selling earlier than the equity markets did in the fourth quarter last year. In my experience, early warnings from HY investors happen before 60% to 70% of bear markets, so this comparison is a good one to review on a regular basis. My concerns here are worth keeping in mind, but the underperformance among HY bonds is distorted by so many bond funds going "ex-dividend" today. The ex-date is the day that bond fund shares are trading without the next dividend payment that will be distributed to shareholders in a few days. Stocks and ETF shares usually drop by the amount of the expected dividend on their ex-date, which accounts for some volatility. However, even if we account for the dividend issue, HY bonds were more negative than I would have expected today. One day doesn't make a trend; I think investors can give the market the benefit of the doubt for now, but they should continue to watch risk indicators like the HY market closely. Side Note: There are a few different ways to adjust a stock or fund chart for dividends. In my opinion, adjusting the chart each ex-date is the most consistent, and most charting applications will use that approach for stocks and some funds. However, most brokerage charting applications inexplicably delay a year or more to adjust bond fund charts. If you compare my chart of HYG below with the charts from your broker or other charting application, you should be able to notice the difference right away. Be careful when applying technical analysis to a chart that may not have been adjusted correctly. Today's rally was particularly good for the banks and manufacturers. Long-term interest rates moved higher, which may help improve the short-term outlook for banking margins. If this trend continues, it could also help improve the outlook for earnings season because the big banks are in the first round of reports.